There are 30000 species of true spider. Spiders have a prosoma covered by a single carapace and joined by a narrow waist or pedicle to the abdomen, subchelate chelicerae ending in fangs with associated poison glands which are used to imobilise prey and modified pedipalps with copulatory and sensory functions. Variable numbers of spinnerets provide silk for webs and trip-lines. Silk is produced as a liquid which hardens into a thread as the spider pulls and manipulates it with tiny claws at the end of each leg. 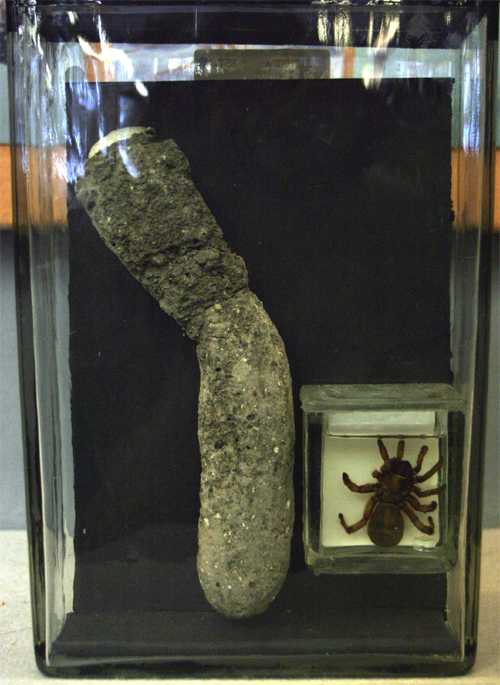 Silk is used for webs, cocoons, lairs and traps, underwater bubble chambers and guide lines for water spiders, and the tunnels which house trap-door spiders, as shown to the right.